How will they organise the exploration? e.g how to measure the hand? What method to use when picking up the sweets? What are the controlled variables? What is the independent (changed) variable? What and how will be measured? Standard or non-standard units? What equipment, if needed, and how to take measurements? Do measurements need to be repeated and an average calculated? How to present a conclusion based on the evidence? After the activity, the children were asked if they could have made any improvements to their investigation and were there any links to maths during their investigation? 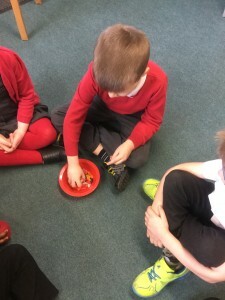 They were also allowed to eat the sweets once they completed the activity! This Science Day was once again thoroughly enjoyed throughout the school! We are looking forward to Monday 26 March as we have booked the Kinetic Science theatre company to perform a production of ‘Down to Earth’ which explores the wonders of Earth and Space. Thank you to everyone who sent in their £2.00 contributions to help make these days happen. Posted February 9th, 2018 in Science.